New Price Adjustment! Detail-oriented owner just rebuilt this home but now looking to move. More than move-in ready in the heart of Ocoee…this house has been totally re-built – basically a new home! New roof, plumbing, electric, HVAC, ceramic tile throughout. New double pane, gas injected windows and updated insulation for energy efficiency. 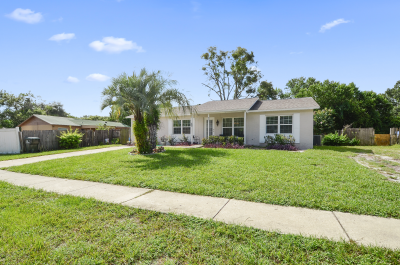 Kitchen provides plenty of storage and work space with updated stainless steel appliances, new cabinets, while allowing convenient access to the dining room and patio. New fixture and ceiling fans. Washer and dryer included. Generously sized bedrooms with a split floor plan offer plenty of space for family, a nursery, guests, home office, and nearly anything else to fit your needs. Large 4th bedroom garage conversion has its own entrance (could be used as a mother-in-law suite.) The home features a big fenced-in backyard. Nothing needs to be done here except move in! So schedule your visit today!